Finding a quality leather jacket under $400 is not an easy task. DSTLD's $350 Leather Moto is a hidden gem of the internet, with designer-level quality at direct-to-consumer prices. We ranked it as the best affordable leather jacket you can buy, and it's been a mainstay of my closet for the past year - growing softer and more customized over time. Unless you get lucky with a hand-me-down from a stylish parent or strike gold in a vintage shop, finding a quality leather jacket that you like for less than $400 is typically a pipe dream. You can throw a stick and hit a vegan iteration for less than $200, or you can part with $200 for a thin one you'll wear for a season and ultimately accidentally leave at a restaurant or donate. Either way, it'll probably feel like an underwhelming purchase just to fulfill the need for a closet staple. If you're looking to adhere to the ideals of "fewer, better" - or you only want to devote closet space to things that genuinely bring you joy to wear, you should avoid these cheaper, sub-par options. DSTLD's $350 Leather Moto Jacket is an exception to this rule. It's a (relatively) affordable leather jacket that looks and feels like its designer quality, but for quite a few hundred dollars less. I've had mine for about a year, and it's a mainstay of my closet. People regularly ask me where I got it - including fellow product reviewers who have been aged into hyper-cynicism and selectivity. Over time, it's broken in to become one of the softest leather pieces I own, and the fit has become more customized - as you'd expect from a great leather jacket. The DSTLD Leather Moto, like all of DTSTLD's offerings, is a classic done extremely well. It has adjustable buckles at the waist for a perfectly customized fit from the outset, reinforced elbow patches, and an asymmetrical zipper with silver hardware accents. It's shape is contemporary thanks to its cropped silhouette, but that's it in terms of alterations that may otherwise date the staple. The leather is durable and felt thicker and tougher at first than expected at first, but over the past year has worn into a buttery softness. It has a light coating to add a soft sheen, enhance its lifespan, and give it an extra layer of stain protection. Leather loosens as it breaks in, but the adjustable buckles mean you'll remain in control of how your moto fits. Mine has loosened a bit over 12 months, but the size small is still perfect. As insurance, the startup offers free shipping, free returns, and a 100% fit guarantee. DSTLDCurrently, the jacket comes in five styles: silver leather, white leather, black suede, smoke suede, and black leather with silver hardware - each for $350. I first heard of DSTLD - an LA denim startup - last year when on the hunt for exactly this staple. Their product line is best-described as timeless essentials done mercilessly well - which, for a primarily online brand, could be seen as a thankless task. DSTLD pieces are a bit more expensive than the average person probably spends on each staple, but is made with the designer-level quality that fetches a way higher price at department stores. However, it's tough for the online shopper to know they're paying more for a far better deal - they can't touch the leather, stretch the under-$100 premium denim, or check the softness and opacity of the T-shirts online. And yet, the startup has earned a dependable reputation for itself and built a loyal consumer base - even inviting its shoppers to become investors - and has begun expanding to brick-and-mortar stores. DSTLDThe DSTLD Leather Moto comes with adjustable buckles at the waist for a perfectly customized fit. The estimated traditional retail cost of the Leather Moto Jacket is $1,600, but it's listed on DSTLD for $350. "Our jacket is not distinguishable from any other $900 leather jacket," DSTLD founder Corey Epstein told The Strategist, "But it's the only one that's $350." That's one reason why we named it the best affordable leather jacket you can buy in the Insider Picks Buying Guides. Currently, you can get the classic Leather Moto in five styles: silver leather, white leather, black suede, smoke suede, and black leather with silver hardware - each for $350. All in all, DSTLD is a great one-stop shop for high-quality classics done in the urban uniform's monotone of black, grey, and white. 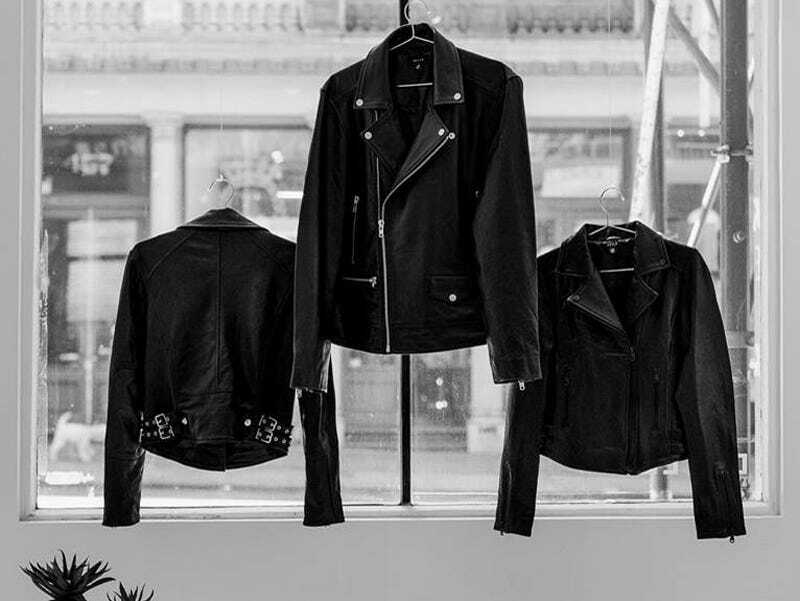 But, if you buy one thing from the LA startup, it should be their $350 Leather Moto Jacket. It's one of the best deals you're likely to find if you're shopping for a classic leather jacket, and, in my experience, it's only gotten better with age.